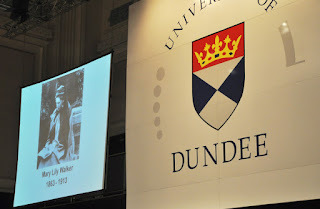 Mary Lily Walker's story was told at all 6 graduation ceremonies at the University of Dundee last week, a story that was also covered by the Dundee Courier. Principal Pete Downes spoke of her in his Graduation Speech, doing so underneath an image of her projected on the screens. That means that last week approximately 9000 people heard something of her story. Let's keep telling it! Principal Pete Downes telling Mary Lily Walker's story. Mary Lily's picture being projected to 1500 people. 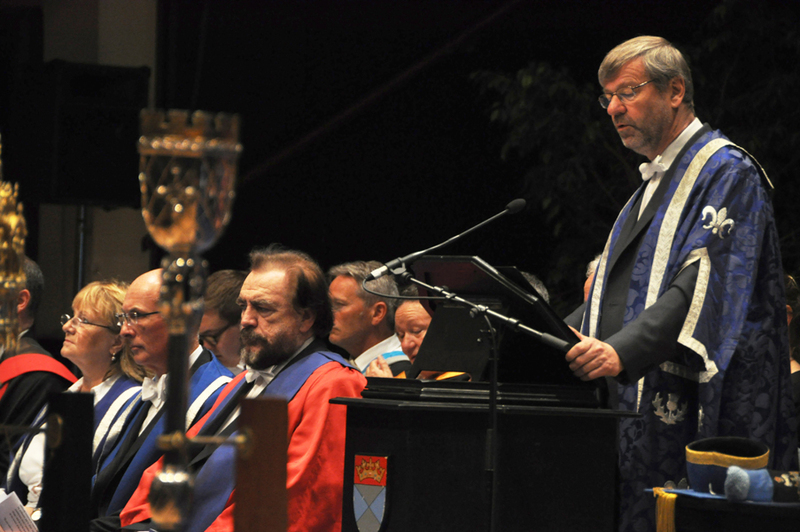 Let me now tell you a story that vividly illustrates the richness of our history at the University of Dundee, and our commitment to transforming lives. It is the inspirational story of one of our first graduates, Mary Lily Walker. On this, the centenary of her death, I would like to take the opportunity to champion her achievements. Mary Lily was not only one of the first women in Scotland to be taught in the same classroom as men, winning prizes in Botany, Biology and Embryology, but was a pioneer for social reform in Dundee and beyond. Her innovative approach to addressing the issues facing mothers and children in Dundee at the time led her to found the UK’s first mother's restaurant, to provide sustenance for nursing mothers, to set up a women’s hospital where women could be treated by female doctors, and to set up children’s clinics in Dundee. And the achievement for which she is best known, the founding of the Grey Lodge Settlement in Dundee, which educated social workers and offered classes and activities for children in the city, still thrives today after she willed her properties to the oranisation. Mary Lily also wrote the highly-influential Dundee Social Union Report of 1905, which revealed the deplorable working and living conditions in Dundee, especially the dreadful infant mortality rate. This was a publication that was talked about in Parliament, and which was influential in Liberal social reforms. 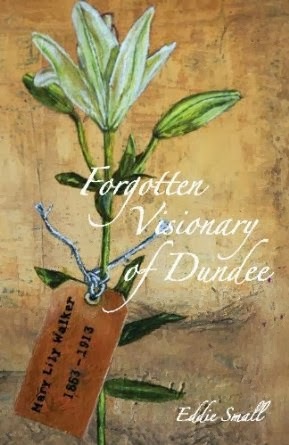 Before her death, Mary Lily went on to become one of the first women parish councillors in Dundee, and was one of only two women asked to write for the British Society for the Advancement of Science Handbook in 1912. Mary Lily died in July 1913, four days before her fiftieth birthday, but in her short life she transformed the social conditions of women in our city and beyond. As an institution we at the University of Dundee take inspiration from Mary Lily’s story. If each and every one of us tries to emulate her ambition, innovation, and imagination and applies those principles to the way we teach, to our research tackling complex global problems and to harness our efforts to transforming lives, then we will reach our goal of becoming Scotland’s leading university within 25 years and, who knows, maybe even less time! 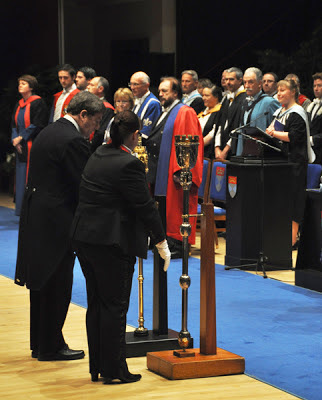 As an interesting aside, we recently learned something interesting about the mace, carried at all graduations at the University of Dundee (see below). It turns out it was gifted to the University in 1913, to commemorate the 500th anniversary of St Andrews University (to which University College Dundee was once affiliated). It was presented to the University by Mr Rudolf Polack, whose wife, Mrs Polack, was for many years on the board of the Women's Hospital started by Mary Lily Walker and colleagues. Once you start delving into the history, there are many intersections!